Ten years ago, as a fading band rocked a faded R.I. club, an explosion of flames killed 100 and injured many more. For survivors, the road back has been unthinkably hard. The cake is lush and bright and perfumes the room with the scent of lemon. “Happy Birthday Nicky,” it reads in baby-blue cursive. Nick died 10 years ago in The Station nightclub fire in West Warwick, R.I. But his parents still give him birthday parties. They speak to him every day as though he’s in the house, coming and going and very much alive. They detect messages from him on passing license plates, and in the flickering light in the dining room. It’s Nicky checking in, they say when the bulb inexplicably lights up. That night of Feb. 20, 2003, Dave dropped the lanky 18-year-old at a friend’s house before a concert by the rock band Great White. “The show must go on,” Nick said as he got out of the car, the last words Dave ever heard from him. The time that followed was an incomprehensible fever dream, threaded with pain. Joanne relived the fire repeatedly in nightmares, always trying to save him. And of all her questions, one tortured her most. Did her child feel pain? Then they started seeing the signs, and there was comfort. At today’s party, they hope for more, to speak to Nick. They have invited a woman who says she communicates with the spirit world. She takes a seat near a glowing fire in the living room. The guests gather on the sofa and chairs. Joanne and Dave sit, take hands, and watch expectantly as she begins. The Station nightclub is now just a barren parking lot on a stretch of suburban road. There is a rusted marquee and a patch of leaf-covered dirt staked with crosses made of lumber from the fallen building. On occasion, a figure can be seen stopping to leave mementos. The site betrays little of the horror of that cold Thursday night 10 years ago, when, in just six minutes, flames ignited by pyrotechnic sparks exploded into an inferno of poisonous gas and unimaginable heat. One hundred people died. Firefighters found the dead jammed like matchsticks into a narrow hallway at the front door, where people clawed over one another to escape, or in scattered clusters where they were trapped or searched in vain for other exits. The roughly 350 who made it out — some of them horrifically burned — heard screams inside and, as the flames rose, heard them fall silent. The site of The Station nightclub is now barren aside from crosses that were made of lumber from the fallen building. Some lost friends or loved ones who had been a step behind; the difference between life and death was often inches, or seconds, or dice-roll decisions to move one way instead of another. For the survivors and the families of the dead, the hell inside the tiny roadhouse that night became a cataclysm upon which new lives had to be built. Some, like Gina Russo, who underwent 54 surgeries for severe burns, channeled their pain into public causes. A few, like Angel Amitrano, who lost her father, moved far away. Many are left with memories and tokens they can neither forget nor keep too close, like the family of Matthew Pickett, an avid concertgoer who set out to tape the show but wound up recording his own death. Investigators gave them a remastered copy, but they have squirreled it away, vowing never to listen. Dave and Joanne were forced to find their own path, as did Melanie Fontaine, whose journey began moments after the fire started. Just before the lights failed and black smoke enveloped her, Melanie Fontaine released her fiance’s hand. The instinct to hold tight ceded to the desperate thoughts churning through her mind, and she let go. John had reached back to clutch her hand just a moment before, when the mass behind them started to push in a panicked surge toward the door. Melanie pictured the two of them getting crushed and knew how much worse off he would be, brittle-boned and stooped from a painful genetic condition, more likely to fracture something. That was her fear then — not the fire. And over the screeching alarm and the rising din of human noise she shouted to him and let go. He would be steadier on his own. He was a step closer than her to the door. He’d be OK.
She hoped her brother Mark and his friends were close behind. Sudden darkness changed everything. She was choking, blinded. Around her was nothing but screaming and shoving, everyone for himself. Something knocked her down, something else swept her to the side. Stay down, she thought, and started to crawl. She was disoriented and didn’t know which way was out. The layer of inky smoke at the ceiling ignited, and a blast-furnace flash roared overhead. A sting, like high voltage, seared across her hands and back. Strange. Shouldn’t it feel hotter? She was on fire, she assumed, and, reaching a hand before her, felt a wall. She turned her back to it and pressed hard, hoping to snuff out any flames. Then she slouched. A dreamy feeling was coming over her, and she felt herself drifting, as though to sleep. If this was dying, it didn’t seem so bad. But then, a pinprick of thought: What if she and her brother both died here? How will Mom and Dad survive? A voice crackled inside, shattering her daze. Go! it shouted. You have to try! But left or right, which way? She held her breath and went, not knowing where she was going, just feeling along the wall, crawling and touching. She came to a gap and crawled into what she would learn was the kitchen and kept going until she burst all at once out onto the snow. It seemed almost too easy, she would later reflect, when she learned of the other deaths. She would think of her fiance and repeatedly see her hand letting go of his. The roads near The Station were full of panicked drivers. Dave Kane had heard the club was on fire from a TV bulletin on the 11 o’clock news. Nick didn’t answer his phone. He and Joanne drove as fast as they could. The scene was a chaos of flashing lights and police barricades. They couldn’t get close enough to learn anything so they drove frantically from hospital to hospital. Over and over they dialed his phone. At a hastily assembled crisis center, workers had an ominous request: bring dental records. It seemed hazy and unreal to Joanne, as though she was being forced to perform a role in a play and watch herself at the same time. Nick’s half-brother Chris, Joanne’s son from another marriage, arrived early in the morning from Boston. Of course Chris had heard — why else would he rush through the dark of early morning to get there? His mother seemed confused, and he was frightened for her. They drove back to the crisis center, where officials announced names of survivors as hospitals identified them. Nick’s was not among them. Joanne wouldn’t eat, was barely able to speak. She seemed physically crushed. “I was afraid she wasn’t going to survive the experience,” said her son, Bill, another half brother of Nick’s, who flew from California. At some point that day, Joanne says she threw herself across Nick’s bed and cried herself into a troubled slumber. Waking sometime later, alone in his room, she says she felt somebody breathing beside her. In the hospital, Melanie floated in morphine dreams. She remembers only bits and pieces: Her mother rewrapping her hands after the nurses had gone, winding the gauze around each finger, watching the death count climb on TV, waiting to hear familiar names. She was black all over when she arrived, even her teeth. The nurse who cut off her clothes had gasped at the sight of her back. She was on her stomach in bed, hands positioned on pillows at her head. She remembers her mother helping her to the sink and gently washing her hair, brittle strands cascading into the water and the retching stench of the fire filling the air. Since the day on Nick’s bed when her pain was eased by the sense of him nearby, Joanne had begun to see things that she interpreted as her son communicating with her, like the time stamp of 9:41 on a text message wishing the family well. Nick had had a fascination with the number 41 since he was a teenager, pointing it out on hotel doors or street addresses or anywhere he saw it. The day after the fire, Dave, who hosted a radio talk show, received a call at home from a woman he knew who says she is a spirit medium. She told him she wanted to go on his radio show because a charred boy had appeared to her and said, “Call my dad.” As Dave recalls it, she hoped someone would recognize the story and call in. Dave concluded the boy in the woman’s vision was Nick. Dave and Joanne soon began to see signs everywhere. They noticed things happening at 41 minutes past the hour, and when 41 cropped up on buses and license plates, area codes, and restaurant checks. They realized Nick lived 18 years and 23 days, and that those numbers add to 41. Determined to make more direct contact with their son, they made an appointment to see Robert Brown, a British man who staged events across the globe to communicate with spirits. He also held private meetings. He was to be in New York that fall. In September, Dave survived two heart attacks. A month after bypass surgery, they rode Amtrak to see Brown. The author dazzled them with details about Nick, which they believed were personal and intimate and true. How could he know these things? As the session was ending, Brown added: Your son wants me to tell you that the show must go on. Joanne and Dave were thunderstruck. There seemed no earthly way Brown could have known Nick’s final words to his father, except from Nick? They left the appointment elated and utterly convinced their son is a living spirit. They strolled Manhattan, laughing and weeping, until landing at a deli, where they ate like ravenous castaways. Melanie’s mother, Chris, walked her daughter slowly through the darkened house, trying to take away the pain. The hospital had sent Melanie home early. Chris was a nurse and convinced them she could handle the dreadful, painstaking work of changing bandages and cutting away decaying skin. But when the morphine wore off, the pain became a livid scream inside Melanie’s body, radiating from nowhere and everywhere. Chris led her daughter, whispering, crying with her. It would be OK. One day, it would be OK.
Chris had to try to believe that, too. She had stayed above water while taking care of Melanie in the hospital, was able to keep at bay the almost certain death of her son. But then she came home to see Mark’s car in front of the house, towed from The Station, and finally it was real. Her grief swallowed her, and she had to be carried into the house. She ached for her daughter now, needed to take care of her. And so they shuffled through the house, down the corridor bridging the bedrooms, around the family room, lap after lap until the sun came up. They would get stronger pills for Melanie’s pain, but they didn’t help with the agonizing reality crystalizing in her head. Her brother and fiance were gone. When she had let go of his hand in the club, she had a flash that it might be forever. And now it plainly was. She woke mornings, replaying the moment. She loathed herself for getting out so easily, berated herself for not finding John and Mark in the choking, scorching madness and leading them out. She spoke aloud to Mark, asking from his bed if he could hear her. On the other side of the wall, Chris would wake from restless sleep and realize all over again that her son was dead, the blow knocking the wind out of her each time. But Melanie needed her, and she would force herself from bed. They could fill a day treating and dressing the burns and doing it again a few hours later, Melanie leaning over their kitchen table, beneath a big framed photograph of her and Mark in high school. Moving slowly, Chris would lift the yellowish-white parts of each blister with forceps and snip away with scissors. She would slather on antibiotic cream and skin-loosening ointment, bandage Melanie’s back, wrap her hands and fingers with gauze. Chris took comfort in a sweater of Mark’s, inhaling the fading scent of his once-heavy cologne. Sometimes, she went out to the site of the fire. She thought maybe she could feel his presence in the place where he last lived. She bought bags of tea candles and lit them, retreated to her car to watch them flicker. She and Melanie talked, replaying the fire, trading stories about the boys. How John, in a wheelchair then, had rolled up to Melanie that first week in school, bowed, kissed her hand. How Mark couldn’t pass anyone he loved without reaching out to pat or hug them, how even his friends learned to kiss and hug his parents goodbye. And as Chris had done in the hospital, she stood over the sink and kneaded her fingers through Melanie’s hair, lathering, rinsing, releasing more of that horrible stench. It was a weekly ritual, the smell persisting, until Melanie could stand it no more and cut off her hair. As time passed, Joanne and Dave say, Nick sent signs every day. Each brought a feeling of relief, like when any child checks in with his parents. The family trained itself to refer to Nick in the present tense. In 2004, nearly a year after the fire, the family celebrated Nick’s birthday at Chelo’s restaurant. They saved an empty seat at the long table for the birthday boy. That was where they told the wait staff to put the cake, and the staff and the family all sang Happy Birthday. Melanie’s mother wipes the face of a 20-month-old girl with a floral ribbon in her hair and lifts her from her high chair. “Kisses and hugs for Gabe,” she says, and lets the girl’s 3-year-old brother nuzzle her before carrying her upstairs to bed. They are Melanie’s children. Chris comes to babysit twice a week now, 10 years after the fire, in the little house Melanie bought on a quiet street in Southbridge two summers ago, an hour from where she grew up. The winding road that led here from the fire took time to reveal its course. After Melanie’s burns healed, she could not conceive of going out with friends, never mind dating. Chris told her that she would meet someone, live again, and that hers would still be a good life, if one very different from what she had planned. Melanie did not believe her, not at first, but she began to make peace with what happened inside the club the night she let go. She learned that John and Mark were likely killed instantly by the blast-furnace flash that burned her. It gave her comfort. They didn’t suffer, and there was nothing she could have done. She came to believe their spirits helped guide her out, and now they wanted her to live. 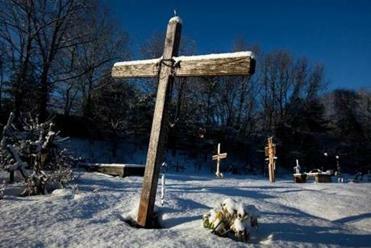 She crafted elaborate crosses for her brother and her fiance and for the two others from their group who died, painting and repainting them, decorating them with mementos. She took them to The Station site and planted them in the ground. Sometimes Melanie went with Chris to West Warwick, and sometimes her mother went alone, Chris’s own visits becoming twice-weekly, then weekly, now monthly. She no longer buys tea candles by the case; she can visit The Station without crying. And years after the smell of Mark’s cologne faded, his sweater, long since washed, rests comfortably in a drawer. But he remains her first thought every morning, her last at night. In the Southbridge house, Melanie’s son sings his way down the hall, skating in an imaginary game of hockey. She will never forget that night, but it no longer defines her. “She has found her place in life,” her mother says, proudly, trying not to imagine what would have happened if Melanie had gone another direction that night. If Melanie had not let go. “My birthday,” replies Nick’s half-brother Dave, born on March 18. Dave rubs Joanne’s shoulder. Joanne’s posture is tense, but her eyes are soft and smiling. “Where are my shoes, Ma?” the medium says, relaying words from Nick. “In the closet,” Joanne replies. “It’s his way” — Nick’s way — “of saying he was right there,” the medium says. The session over, people get up and gather around the cake. The family sings Happy Birthday, with gusto. Little nephew Asher puffs out the candles. Joanne cuts the cake. She is in a very good mood. Joanne and Dave understand people outside the family may roll their eyes. Or that some will think: How sad for that poor family, hurt so bad they created an imaginary son. Mark Arsenault can be reached at marsenault@globe.com. Follow him on Twitter @bostonglobemark. Eric Moskowitz can be reached at emoskowitz@glob.com.